This is a bit different from a normal road test. 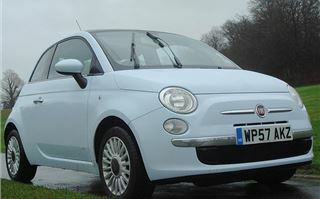 For a start, it’s a very important car: ‘European Car of the Year’ 2008. And I’m thinking of buying one. The sense of this won’t be missed by other people with small limited companies. Because, until 31st March, 100% of the cost of a car emitting less than 121g/km CO2 can be offset against corporation tax. And, as long as I pay for my own petrol, I’ll be taxed on a BIK of 13% of whatever the car costs. 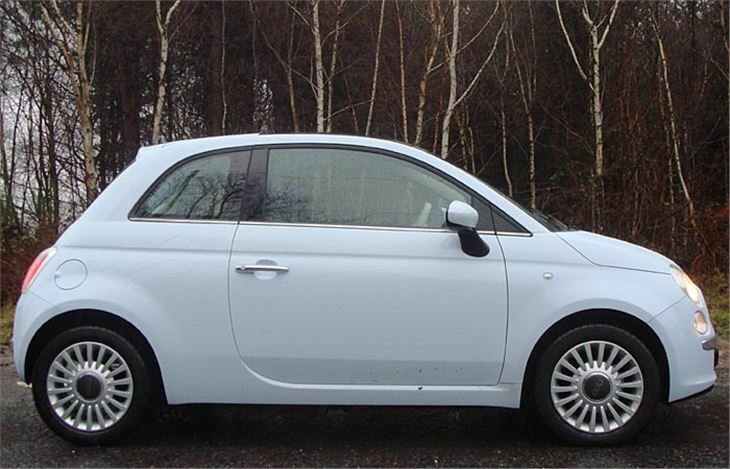 £7,900 (for the 1.2 Pop petrol) and I’ll be paying 40% of £1,027, which is £410.8 a year. 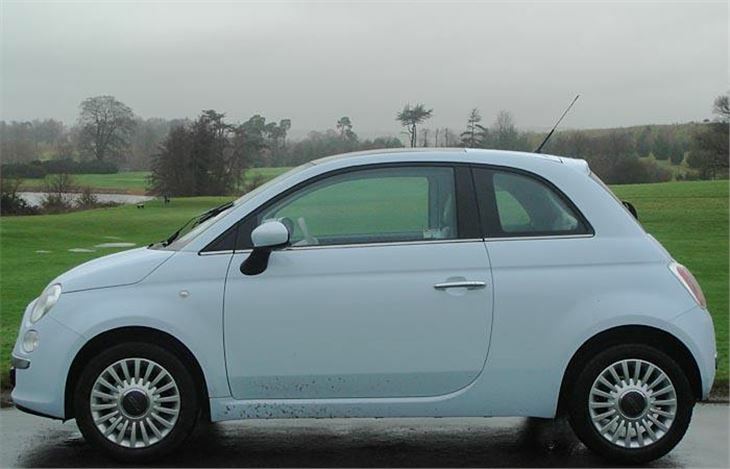 £9,300 (for Pop diesel) and I’ll be paying 40% of £1,209, which is £483.60 a year. Even if I went mad and plumped for the Lounge spec diesel at £10,700, my tax liability would still only be £556.40. And I’ll be driving around in this year’s most chic new car that could end up worth close to what I paid for it by March 2009. So I wasn’t just interested in what the 500 was like from your point of view. I was looking at it from my point of view. As you can see from the photos, the new 500 is far more faithful to the look of the original Dante Giacosa 500 than the BMW MINI is to the Alec Issigonis Mini. The 1950s 500 was the car that liberated Italy. It literally put the country on wheels, and remains much loved and still surprisingly prevalent in Italian villages. Also, much loved in, and an astonishing number of Italians owe their lives to FIAT 500s, or rather to what mama and papa got up to inside one with newspapers plastered over the windows. Of course, instead of an engine in the back, the new 500 has an engine in the front. 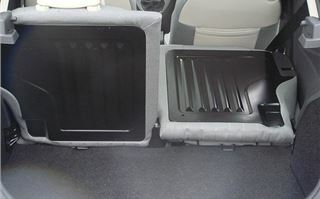 And, rather than a drop-down engine cover at the back, it has a lift-up hatchback. It’s based on a Panda, so many of the bits that aren’t retro are actually pure Panda, fortunately including the Panda’s excellent centre dash and gearshift lever. 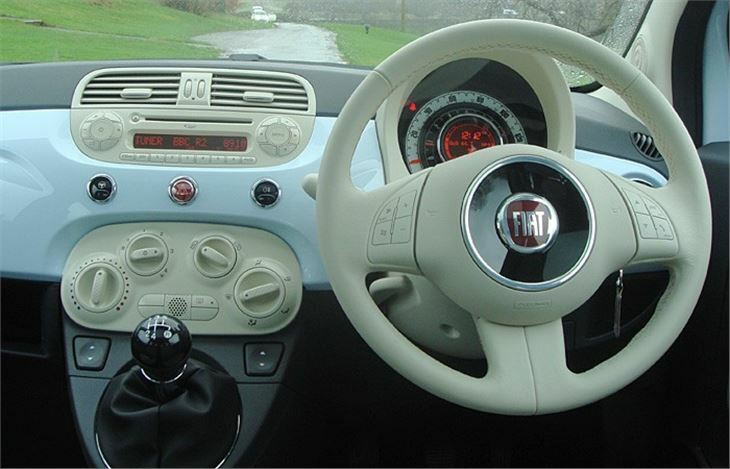 And, like the MINI is to the Mini, it’s about half a size bigger than the original baby FIAT. Practical, it isn’t. But is it fun? 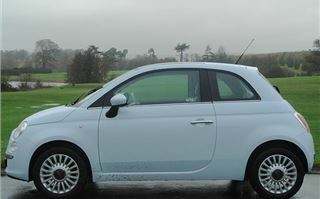 Does it have the brio the best small FIATs always had? Is it as good as it looks? Since I was restricting my carbon tyretracks to 120g/km I only drove the 1.2 petrol and the 1.3 Multijet diesel, as it happened in ‘Lounge’ and ‘Sport’ specs. And it was a filthy day to be out driving with the threat of flooded roads around every corner. Get into the car and you are first confronted by a masterpiece of a panel. 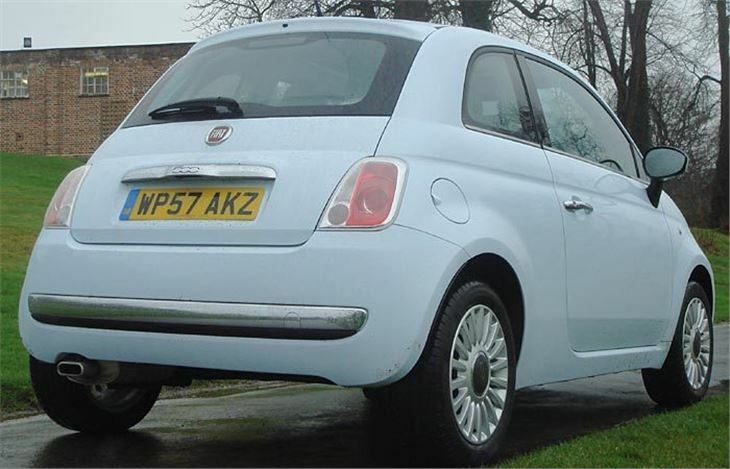 Body colour, like FIATs used to be, but plastic rather than metal. And in ‘Lounge’ spec by a beautiful cream leather-covered steering wheel. That adjusts up and down by a fair bit and the seat height rises and falls on a hinge so the higher you ratchet it up the more you lose thigh support. The backrest has thumbwheel adjustment. And I’m pleased to report that if you fold and slide the seat forwards to let someone into the back, it returns to the settings you chose. 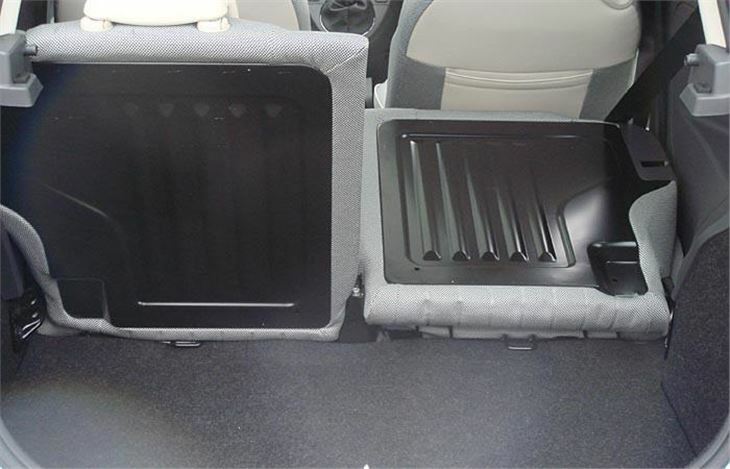 If you’re 5’ 9”, then a similarly sized human can get into the back seat behind you, but there’s not a lot of headroom even in 500s that don’t come with a sliding sunroof. In the front seat, though, even with a sunroof, I could wear my hat. The key is a nice, expensive looking folding job with remote buttons to open and shut the doors and the hatchback. Turn it, and the 1.2 engine doesn’t burst into eager life like a Pug puppy. Instead, it’s surprisingly refined and gentle, with decent torque and tractability and surprisingly high 22.5mph per 1,000rom gearing in 5th. The five-speed gearbox is, of course, a delight, with the huge knob in exactly the right place and perfect change quality. With only 69bhp to play with you obviously have to stir it quite a bit. But the engine is so smooth it doesn’t object to being held in 3rd when you’d have been on 4th or 5th in a more powerful car. And, over around 80 miles of town and country driving in dreadful conditions, it averaged a very creditable 44.6mpg. Another benefit of that low 119g/km CO2. Handling is actually a bit better and more assured than the Panda. It’s no sports car. But it’s no dullard either. Not quite as sharp as a MINI One. 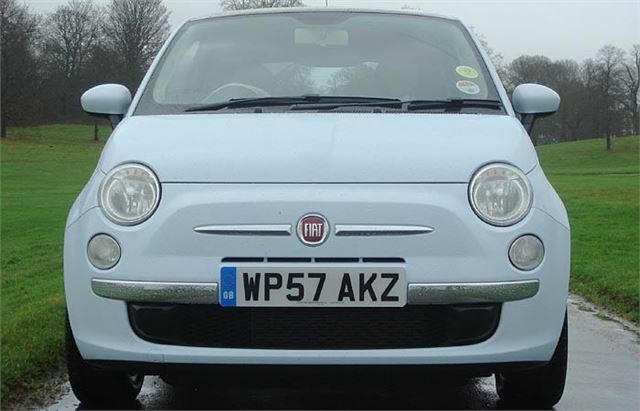 But enough fun to keep a smile glued to your face, with excellent brake balance and reasonable ride comfort. I’d be happy to spend quite a lot of time behind the wheel. But would there be any point in paying £1,400 more for the 1.3 Multijet. That has more power and more torque, both immediately apparent. But the diesel brake vacuum pump sometimes left the pedal feeling very sold and the extra weight of the diesel engine meant more understeer on bends and roundabouts. It’s slightly higher geared than the 1.2, at around 25mph per 1,000rpm. And much more economical. Compared to the 1.2’s 44.6, I averaged 57 in the diesel. So it is a possibility, and if I did more mileage in a single car than I do, I’d probably go for it. 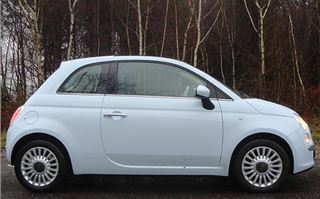 But, being a cheapskate, and actually preferring the 1.2 to drive, I think I’m going to plump for the base model £7,900 1.2 Pop, in solid factory white, possibly with an Italian tricolour roof and bonnet stripe, the Blue&Me phone kit and the intriguing ‘Vintage’ hubcaps at £70 a set. It’s in the hands of my accountant.